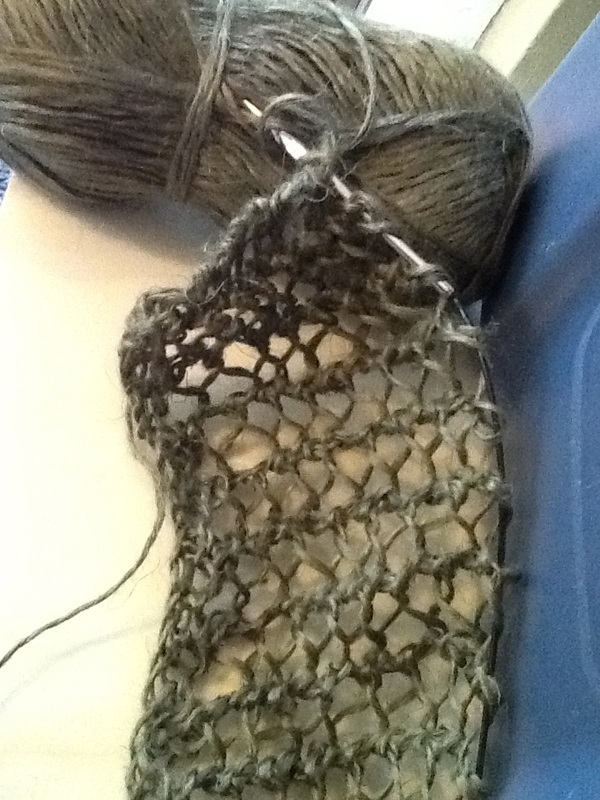 It has been a super long time since I've knit this camisole. I just checked my files, and I think I designed this as "lace camisole" for Knit Picks in 2006, when they had just started their design program. They asked me to use a novelty yarn, which resulted in a red camisole and a neon yellow/green one. Then, when the copyright reverted to me, I released it on Ravelry as the Turkish Lace Camisole. I seemed to remember it as a quick, satisfying knit...and bear in mind, 4+ years without sleep means I can't remember much of anything! 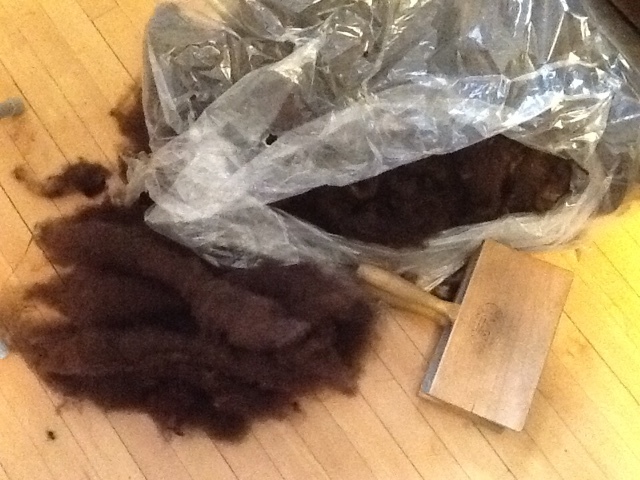 So, when I happened upon some lovely linen yarn at a local yarn shop's sidewalk sale, I decided to give it ago. I've started a knit-along in my Ravelry group in case anyone wants to join me for a relaxing knit and summer chat session...but for now, I'm finding it delightfully airy, cool, and fast. Who knows? I might even get to wear it a couple times at the end of the summer, if summer hangs on long enough in Winnipeg! In other news, I'm canning. So far? Apricot, Nanking Cherry, and Blueberry-Plum-Vanilla jams. I'm hoping to fit in some pickles, salsa, and chutney later on. As the summer progresses, I'll be doing more chasing of twins, as we don't have much childcare scheduled...so all bets are off as to how much will actually happen! We might have to go to the wading pool instead...and I might have to wear a new cover up. It was hot, but it wasn't all that hot, since the professor and I used to live in hotter places like North Carolina and Kentucky. That said, we don't have air conditioning, so when it cools down at night, we position the fans in front of open windows just so. During the day time, we close the curtains to keep in the cool. Except, not all of our windows have those kind of darkening curtains. 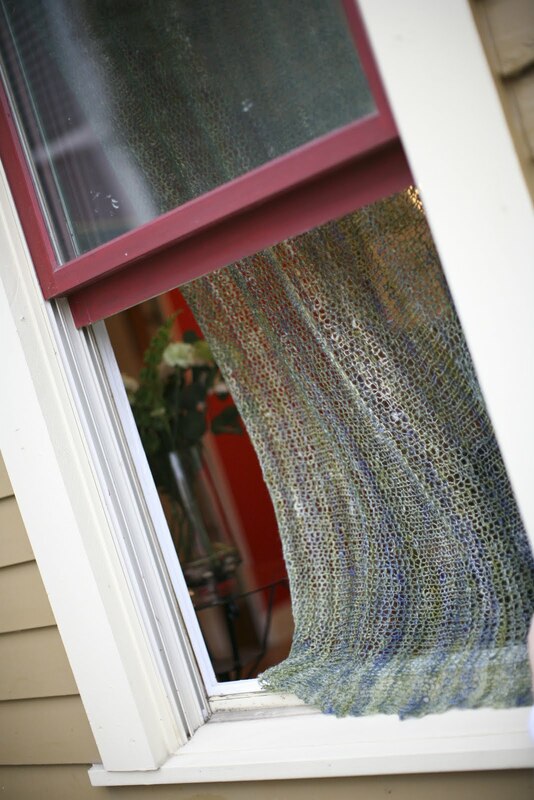 You may remember this Knitted Curtain from my book? 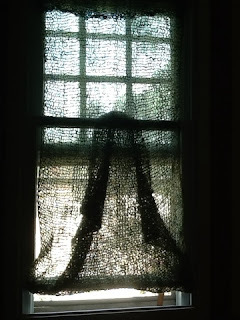 Well, it fit really well in a window in my house in Kentucky. It doesn't fit so perfectly on the window here, but I hung it anyhow because I love it! Here it is, above, doubled up to keep out the heat. In the meanwhile, if you're in a hot place, well, stay cool! Drink iced tea. Sit in the shade. Splash in the pool. And, if you are twin over here, try not to melt down too much into a tantrum. We had one doozy which involved a kid screaming.... "IT'S TOO HOT! TURN ON THE COOL! TURN ON THE COLD!" PS: I'm still knitting, of course. 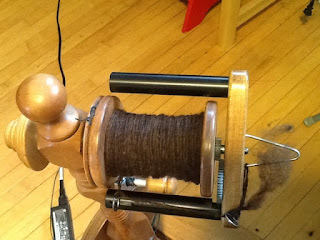 :) A little heat doesn't deter me from spinning (wool!) either. We all come to realizations about ourselves...and sometimes we have to realize it over and over. I'm just not much of a joiner. That is, I seem to do things in my own time, but not really when everyone else does it. So, it has come as a surprise to me that even while other people have started their "Tour de Fleece" in style, I have been managing to spin, card, or knit every day...all on my lonesome. The Tour de Fleece is an event for spinners, where people watch the Tour de France (or not) and try to commit to spinning every day during this period in July. To be honest, I didn't see myself doing this. First, I watch very little TV, and much of what I do watch is kid-related. Second, the 10 days between preschool ending and camp beginning had me very busy with twins and without childcare...but to my surprise, there were brief moments for spinning. I did some wheel spinning as we played in our basement play room, and a bit of spindle spinning while we played in the yard. Unfortunately, we spent a lot of time struggling with a summer cold, an ear infection, and feeling unwell due to the smoke from enormous forest fires, even though they were hundreds of miles away, in both Manitoba and Saskatchewan. Then, summer camp started this week and I threw myself into getting both my work life and our household back in order. Again--I had my own set of surprises. I wrote articles...and then had not one but two editors indicate that basically, I was on vacation because they were. Yup, no articles coming out right now in July, because, uhh, there's no one there to receive or edit them. Maybe next year, I should ask for folks to tell me their vacation dates and social calendars?! Right. So, even though I could work really hard to produce new contacts, pitch to new places...odds are they are also either on vacation or operating on summer autopilot. hmm. Also, I have been the lucky last person in the household to get over this bug, so as the boys went off to camp, I discovered that I really wanted to take a little rest, which was not to be. 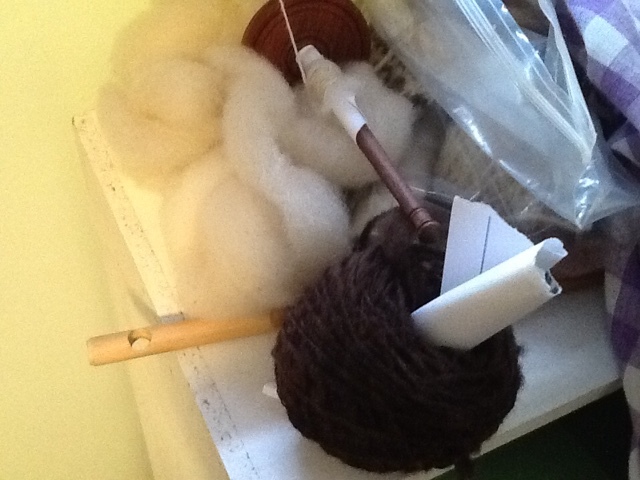 I'm spindle spinning some white Rambouillet cross lamb wool that required combing (by hand) and so I only spin a very small amount at a time. There's no sparkly stuff with sequins, no roving processed for me, but turns out I'm participating --again, in my only special way.